It's a little bit Pokémon, a dash of Harvest Moon and a small slice of old school Final Fantasy. It's also a bit difficult to navigate and a little buggy, but that shouldn't stop you from giving Mini Heroes a go. 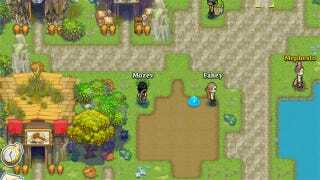 Released today on Facebook, Mini Heroes from Likwid Games aims to please all of the role-playing game fans. It's got monster breeding. It's got growing crops and planting. It's got turn-based role-playing battles and dungeon exploring for up to four players at a time. There's mining and crafting. Hell, you start the game with a pick axe, a shovel and an axe—that certainly sounds familiar. I've been poking about the game for a little bit, and I'm somewhat lost but hopeful that I can find my way. I've been killed by creatures. I planted some strawberries. I've wandered past other folks playing the game in real time, which is novel enough. Perhaps a trip through the game's help files will get me going. And hey, as I typed this the server went down to fix an issue, so it's being tended to. Soon Fahey and his little blue blob Totilo shall be a force to be reckoned with in Mini Heroes. Why not come along for the ride?